The black metal doors of the barbecue pit at Coop’s West Texas Barbeque have the sort of patina that suggests they have stories to tell. One imagines these stories are about men, like Brad Cooper, who do things the old way, the right way, the only way they know how, men not entirely unlike the cowboys who remain the iconic image of the West Texas plains from whence Cooper hails. The place to start at Coop’s (2625 Lemon Grove Ave. in Lemon Grove) is beef brisket, the West Texas barbecue classic. Only long, slow cooking breaks down the tough connective tissue that, in the absence of collarbones, is what supports most of the bodyweight of cattle. In West Texas, brisket is smoked over mesquite, either alone or in combination with other hardwoods. At Coop’s, it emerges from the pit breathtakingly tender with a beautiful pink outer ring, offering both a deep smokiness and profound meatiness, neither overpowering the other. If the mark of a cowboy is how tall he sits in the saddle, the mark of good barbecue is the smoke ring on the meat. This pink outer layer results from a chemical reaction between the smoke and the meat during the long, slow, low-temperature cooking. Although there are cheats for smoke rings—meat tenderizers on the surface, for example—the presence of that rosy ring on tender and flavorful brisket is a sign it was done the right way: the old way. Perhaps the best dish at Coop’s is the pork rib tips—a short, meaty part of the ribs attached to the lower end. Itís detached from the rest during the course of butchering and fabricating St. Louis-style ribs. Where back or spare ribs have bones, the structure of rib tips is cartilage. 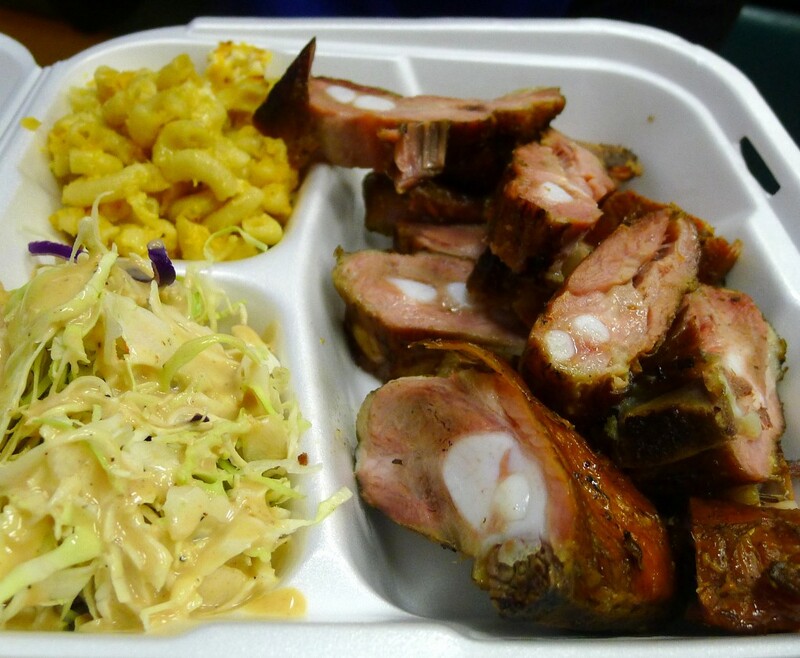 They emerge from Coop’s pit juicy, tender and far meatier than ordinary pork ribs. They are sneaky good and positively addictive. All of the barbecued meats at Coop’s come without an ounce of sauce. While Coop’s offers three sauces on the side—a sweet, a tangy and a spicy—they are, rightly, surplus to requirements. This barbecue is about the meat, not the sauce; the magic of spice rub, smoke, low heat and time provide plenty of flavor. It seems vaguely immoral to mask that flavor with sauce. If you must use sauce, choose the spicy one, which is tangy with a hint of bite. Of the sides, the best is the collard greens braised in a meaty, cabbage-infused broth, a nice counterpoint to the meat. The slaw is not as good, coming off as a shredded cabbage salad with dressing on top rather than a true coleslaw. As for the baked beans: Pineapple? Really? But Coop’s is not about the sides and not about the desserts (which are tasty if you have room). In fact, Coop’s is not even about what comes out of those big metal doors on the pit. Coop’s, at the end of the day, is about what goes into those doors. It is about time: cooking time, generations of time, a different place and a different time and the ways handed down through that time.